Dimitar Ivanov Abadjiev was born in 1965 in Omourtag, Rousse region. Law graduate from the St. Kliment Ohridski University in Sofia. In 1996 he did post graduate studies in American and International Law at the Academy of American and International Law in Dallas, USA. 1991 - bailiff at the Targovishte district court. 1991-1992 - district judge in the town of Omourtag. 1992-1997 - chief judge at the district court in Omurtag. Deputy Chairman of the Alliance for Legal Communication, Sofia. Chairman of the Regional Council of the UDF - Targovishte. 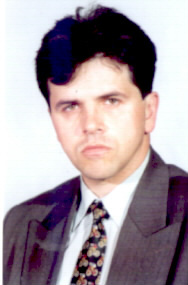 1997 - Deputy from Targovishte, member of the UDF parliamentary group in the 38th National Assembly. 2000 - Member of the National Council of the UDF. 2001 - Deputy to the 39th National Assembly (UDF); Deputy Chairman of the Foreign Affairs, Defense and Security Committee; Member of the Legal Affairs Committee; Member of the Provisional Committee on Constitutional Amendments, etc. 2004 - joins the group of UDF MPs led by Ivan Kostov who split from the UDF to form a new parliamentary faction of the United Democratic Forces and later founded a new political party - Democrats for a Strong Bulgaria. The DSB became one of 22 parties taking part in the parliamentary elections held on 25 June 2005. 25 June 2005 - with the DSB ballot, elected Deputy to the 40th National Assembly (from Veliko Tarnovo). 2006 - dissatisfied with the DSB policy, leaves the party and creates his own political formation. Later in 2006 he headed the European Democratic Path - a newly formed alliance. However, he did not join the group of EDP members who in December 2007 founded the United People's Party. In 2009 he joined the Order, Law, and Justice parliamentary group, and was later elected member of the leadership of the Order, Law, and Justice Party (also known as Order, Lawfulness, Justice, RZS). In the European elections he ran for member of the European Parliament leading the RZS ticket. None of this party's candidates was successful though. On 3 February 2010 Abadjiev declared his wish to withdraw from RZS, because he believed he was no longer "useful" for the RZS Party. Following a number of unofficial reports in the media, on 12 March 2010, Abadjiev announced, in an interview during a TV programme, his nomination for the post of Bulgaria's representative in Nabucco Gas Pipeline International GmbH, seated in Vienna. He is also expected to be nominated as member of the Board of Directors of the Bulgarian Energy Holding, one of the Nabucco Partners.